Paddy Ladd is in the States at the moment and spoke on Monday at CSD Fremont. Yesterday, via a friend on Facebook (thanks Don) shared the PowerPoint slides of his presentation (Copyright: The Deafhood Foundation). I’m sorry to have missed his talk, it was at about 2 in the morning UK time, but the content is clear from the slides. Deaf people have argued for over 200 years that appropriate education is a key to their emancipation. Until now, Deaf people’s claim to better education has been stymied by debates over questionable measures of ‘success’: stats, and grades, and the attainment of particular skills (particular, because ‘speech’ for example is only really a measure of ‘success’ in a particular paradigm). Paddy’s work shifts this focus away from the statistical, to the philosophical, metaphysical, practical and empirical. He shows that Deaf education goes deeper than simple results. There is a real case now for arguing that anyone who denies Deaf people’s right to a proper, Deaf-centred pedagogy, is – effectively – denying their humanity. The forthcoming pedagogy book (as with ‘In Search of Deafhood’ – and whatever you think of Deafhood, you can’t deny that it’s had an impact) promises to land like a time-bomb in the middle of Deaf educational policy – and could trigger a real, and lasting revolution. Anyway – that’s not really the point of this post. Rather, the point is to pick out all of the bits in the presentation where Paddy talks about pedagogy as something specifically ‘spatial’… and to underline the fact that a Deaf pedagogy is not simply separating Deaf people out into a separate system (that would be foolishly easy). Rather, Deaf pedagogy is a key to transforming the world into a place where Deaf and hearing are both recognised, and can thrive. My own (limited) exposure to a native, Deaf pedagogy concurs with these points. Deaf pedagogy really is embodied in the production of a Deaf space of learning – one that can only be truly effective when it is native, and produced without any real concern for how it might appear, or validate itself against ‘foreign’, hearing criteria for success. But history clearly shows that Deaf people don’t want to achieve this to simply ‘distance themselves’ from the hearing world… rather, the common call is for recognition, so that they can be a full part of contributing to building (Deaf gain) a healthy, shared world. So far, recognition has meant trying to find some way to shoehorn Deaf pedagogical spaces into structures designed by traditional, hearing-owned institutions like universities. No wonder places like CDS stuck in the craw of places like the University of Bristol. Now, Deafhood pedagogies are arguing that recognition is a starting point… but one that then leads to a fundamental transformation of our learning institutions, so that they become liberal, flexible, forgiving, open, slow, accommodating, and self-aware enough to allow for the production of Deaf and hearing spaces on an equal, and equally valid footing. Now that’s a spatial revolution if I ever saw one. Great post and I’m glad to see the slides from Paddy. I’m in a seminar on Gramsci right now that has me thinking a lot about education. Gramsci writes as much about education as anything. And what he says illuminates and expands Ladd’s presentation. On the one hand, I think Gramsci would say that the concept of “recognition” is an insufficient political goal. On the other hand, he would insist that education is the key to the political viability of the subaltern. And as you say, a “shared world”, not a separate-but-equal world is the vision we have. I guess all I’m saying is, yes!, education is a super-important area for study, and I’m glad to see someone looking at Deaf education through a – I’ll call it – political lens rather than a neoliberal-pedagogical lens. Nice, Mike. I hope you’re still biking safely. I love Gramsci’s work – his assertion that the oppressed are educated into their oppression to the extent that they believe that they deserve to be where they are… is right on the money, and so accurate in describing the Deaf community’s experience. In common with Gramsci, I see Paddy aiming to instil in Deaf people a sense of outrage – a stage of “How dare they have duped us for so long?” and a gradual realisation that Deaf pedagogical spaces are equally valid, and so must, MUST be produced if truth is to be upheld over lies. I think the reaction to that from those who have, thus far, assumed that they have nothing to learn from the Deaf community, will be something to behold. I’m eager to see what that fight looks like. 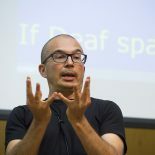 This entry was posted on October 10, 2013 by Mike Gulliver in DEAF, Musings and tagged Deaf pedagogy, Deaf space, Deafhood, revolution, universities.